Alison is originally from Manhattan, Kansas. She was a member of the program from 2006 until 2010, including the year that the program won its second consecutive national championship. 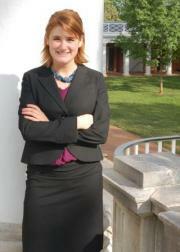 Alison won two outstanding attorney awards as a competitor, including one during the opening rounds of the 2009 national championship tournament. She also served as both a team captain and the program's Vice President for Administration during her third and fourth years. After graduation, Alison worked as a teacher for Teach for America in Kansas City and then attended Harvard Law School. View Alison's career individual awards by clicking here.